Australia's first banknote turns one hundred! May the 1st, 2013, marks exactly 100 years since the printing of Australia’s very first banknote – the 1913 Ten Shilling note. Unveiled in 1913 as part of Australia’s first national banknote issue, and bearing Australia’s first banknote signature combination, Collins/Allen, this groundbreaking 100-year-old banknote issue is among the most historic, most significant of all Australian banknotes. Not only does this note bear Australia’s first signature combination, it was also the first note issued by a Commonwealth nation with a face value of less than £1 – beating Britain’s famous Bradbury Ten Shilling banknote by over a year! The 1913 10/- Collins/Allen is known in contemporary numismatics by its extreme rarity. This rarity is largely attributable to the comparatively tiny number issued. The Australian population was less than five million in the pre-World War I era, and the print-run of Australia’s first Ten Shilling note was approximately 600,000 – an incredibly small number for a denomination that was destined to one day be issued in the tens if not hundreds of millions. Of that tiny print-run, the ravages of time has seen the number of existing examples estimated to be no more than 100 notes. Unsurprisingly, the 1913 10/- Collins/Allen is among Australia’s most desirable banknote issues – hotly pursued by passionate collectors and eagle-eyed investors alike. It still surprises some that, 100 years after printed, a note of such mind-blowing rarity is occasionally seen on the open market, and is not the exclusive province of museums and history books. Tangible evidence of Australia’s very first national banknote issue – and, by definition, tangible evidence of a new era of numismatics in Australia – we have two examples of this excessively rare banknote available. 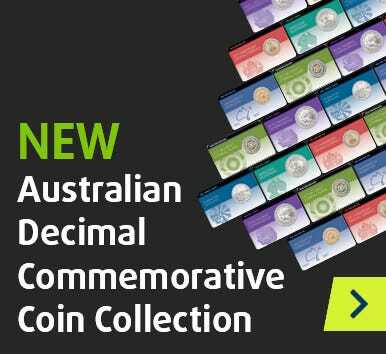 If you are interested in this mouth-watering opportunity to dine at the top table of Australian numismatics, visit Downies.com, or call our rarities expert David Jobson on (02) 9299 4131. Following in the footsteps of 18 other countries, Canada has just announced their first release in a new line of Polymer Banknotes – the new $100 bill. Developed from a single sheet of polymer plastic, this iconic new series has been developed in a bid to win the battle against counterfeit currency. The latest in a long line of new polymer banknotes that can be traced back, at least in part, to the very first Australian polymer banknote, the 1988 $10 Bicentennial note, Canada will join Australia, New Zealand, Romania and Vietnam to be the next country to fully convert to polymer. Enhanced with an abundance of security features, the new $100 note is expected to be issued into circulation by the end of the month. With an aim to have the fifties, twenties, tens and fives circulating by the end of 2013, the new currency is expected to last twice as long as the existing notes and can be recycled upon destruction.